It should not go without mentioning that today is Dr. Martin Luther King, Jr. Day. Over the last few days I've seen all throughout cable television the thoughts of Obama, Lebron, Tiger Woods, Oprah, - people of celebrity status who also happen to be black - their thoughts about Dr. King. Everyone seems to want to talk about his famous "I have a dream" speech. If you really want to read a fine piece of the civil rights puzzle, then what you'll want to do is look up Dr. King's "Letter From a Birmingham Jail". So rather than going into my thoughts about the black community's progression - or in some areas digression - I thought I would just share an essay I wrote that explores one of the many letters that Dr. King had written throughout his mission to see that the United States was truly a land of the free and that all men were created equally. In his “Letter From a Birmingham Jail”, civil rights leader Martin Luther King, Jr., rejects cultural relativism and the identification of morality with laws and customs. Instead he argues that there are certain universal moral principles regarding respect for the dignity and equal rights of all people that must be acknowledged by a good society. When society’s laws are inconsistent with these universal principles, King argues, civil disobedience may be the morally appropriate response. It was because of his participation in a nonviolent demonstration that he was thrown into the jail in Birmingham, and the letter he wrote was a response to a group of clergy who criticized King for his illegal actions. His response is so eloquent and his words are so well-said. The clergy criticize his actions as being “untimely” or “against the law”. King’s approach to this is very systematic. He says that “we know through painful experience that freedom is never voluntarily given by the oppressor.” King told them that direct action was the final step in the process of a nonviolent campaign after the determination of injustice, negotiation, and self-purification. Martin Luther King, Jr. is absolutely amazing for how he approached the civil rights movement and lead it with amazing temperament and grace. Obviously the situation that blacks were in at this time period was frustrating to say the least, but instead of flying off the deep-end he stayed his course when negotiations were useless. He devised the non-violent concept of creative tension. 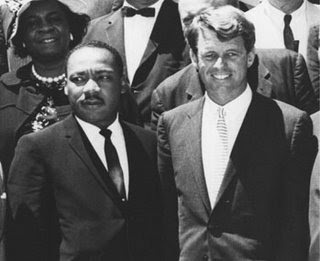 It truly is amazing King was able to establish and lead a civil rights movement through so much subjugation and do so nonviolently with always an ethical and good-natured response to his surroundings. His letter from the jail in Birmingham opened my eyes immensely to why Dr. Martin Luther King, Jr. is such an icon for not only the civil rights movement but for the history of the nation. I'd say that in hindsight it would be awfully hard not to acknowledge the strides that the African American community has taken. There have been a lot of heartfelt firsts for blacks. Tomorrow Obama will be inaugurated as the United States' first black president. I'm hopeful. Not because of all of the hype that has surrounded Obama in his very brief political career, but because during these times of economic uncertainty I think a lot of people are trying to remain optimistic no matter who they had casted their vote for this past election. I feel as though now more than ever all men are created equal - until they open their mouths.